Incorporation of the PSS advanced technology into the CL Professional range has meant a far greater increase in filter efficiency to the degree that maximum pond capacity ratings can be increased by 100% beyond the standard CL range. The key design concept of the PSS is to trap and remove suspended particles and solids from the water which would typically flow straight through many vortex bays and thus pollute any biological media. This is especially the case with small diameter vortex units which are not the ultimate in efficiency. In brief then the PSS can be classified as a highly refined vortex unit, which of course means that any existing filter or bays require far less maintenance this also meaning a greater biological bed is established. Trapping of particles and solids is achieved via Cloverleaf’s uniquely designed and manufactured long life Particle Separation Media (PSM) which is retained in suspension at all times. When the PSM (media) becomes blocked it is time for it to be cleaned via the airstone ring, however any blockage which is visually indicated by water flowing up through the central overflow does not substantially reduce the flow rate through the rest of any filter system so general flow rates/performance are never greatly restricted. Biological integrity of the PSM (media) is always fully maintained in that it is always ONLY ever cleaned via oxygen rich mature pond water. Size 1220 x 1220 x 860mm. 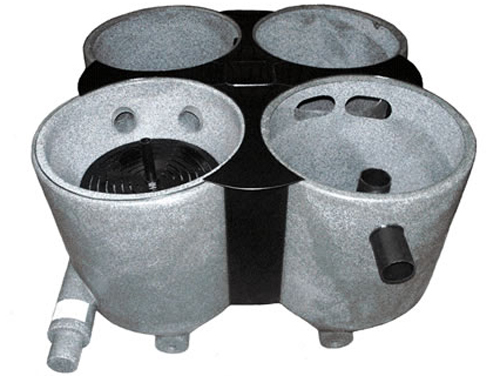 Suitable for Koi ponds up to 7,500 gallons (33,750 litres), or Goldfish ponds up to 15,000 gallons (67,500 litres). This 4 Bay unit comprises of a first stage Bay 1 PSS, with Bay 2 being fitted with mechanical brushes, Bay 3 acting as a main biological bay with its Japanese Matting, and Bay 4 serving as the secondary and final biological/mechanical stage - incorporating foam and the highly proclaimed aqua rock/alfagrog. Note:- Pipe inlet size 110mm (4") - Outlet 110mm (4"). Supplied complete with heavy duty lid, together with waste valves and pipes.